Ukraine promised Hungary to specify the language provisions of the education law. Hungary will no longer block Ukraine's participation in NATO's July summit. At the same time, Hungary's decision to block political meetings of the Ukraine-NATO commission remains in force, the Transcarpathian news website Mukachevo.net has quoted Hungarian Foreign Minister Peter Szijjarto as saying. "I recently met Mike Pompeo in Washington where I told him that we have nothing against Ukraine's participation in the Brussels summit of NATO in July, which will discuss the issues of security in the Black Sea region," he said following a meeting of the Hungarian-Ukrainian intergovernmental working group on Ukraine's education law. 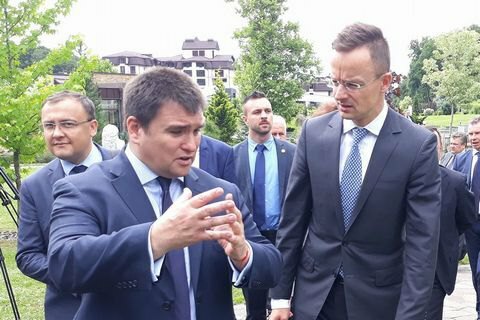 It was attended by four ministers: Szijjarto and Hungarian Human Resources Minister Miklós Kásler, Ukrainian Foreign Minister Pavlo Klimkin and Education Minister Liliya Hrynevych. According to Klimkin, they held very important consultations on the implementation of the education law. The next round of consultations is scheduled for early July because of positive dynamics. "We are interested in saving the Hungarian national minority and in making sure all of them can speak Ukrainian. We should teach teachers to teach Ukrainian, we should change how it is done," Klimkin said. "Transcarpathian Hungarians must preserve their identity but at the same time they should be able to speak Ukrainian fluently. We moved towards very detailed consultations on the implementation of the education law. We will equip rooms for the study of the Ukrainian language in national minorities' schools. The law on secondary education should specify how Article 7 of the education law will be used, and we have discussed this with our Hungarian colleagues," Hrynevych added. Relations between Ukraine and Hungary have been tense since the former passed law on the education law. Hungary considers its language provisions to be prohibitive with regard to Transcarpathian Hungarians, which prompted Budapest to block Ukraine's participation in NATO events.